learning and teaching Wing Tsun Kung Fu since 1984. Changing lives, one punch at a time. Ralph Haenel, German-born self-defense expert and book author, looks back at over 30 years of martial arts training. He started his studies in Judo, Japanese Jiu-Jitsu and Karate. In 2009 he celebrated the 25th anniversary of learning and teaching Wing Tsun Kung Fu. For over two decades now, his life is committed to teaching Wing Tsun full time. Benefit from his experience of having learned in the worldwide largest professional Kung Fu organization. For 16 years Ralph was educated by expert WingTsun masters whose previous careers spanned from professional boxing to full contact champions to military combat instructors. More than 10 years were invested into the development of his teaching and learning method named "The Complete Core Concepts of Wing Tsun Kung Fu". Draw new motivation out of this blueprint for successful training and supercharge your results. Ralph Haenel was born in 1964 in Dresden, Saxon in the former GDR (East-Germany), and has been studying martial arts since 1977. After several years of training in Judo, Jiu-Jitsu and Shotokan Karate, he began to study a system named Wing Tsun Kung Fu. When it comes to pure self-defense without compromise, it is one of the most successful systems worldwide. In the early 1980’s Ralph became the first Wing Tsun Kung Fu student in the country, despite the intolerance of the communist regime. He was already under investigation of the East German State Secret Police (STASI). From 1985 till 1988 West German Wing Tsun Instructors accepted Ralph’s invitation and visited East Germany disguised as tourists and started teaching Ralph privately. Through his pioneering efforts Ralph successfully established several groups for Wing Tsun Kung Fu throughout East Germany prior to the fall of The Wall. During February of 1985 the very first Wing Tsun Kung Fu seminar was being held in Rostock on the Baltic Sea (East Germany). Organized by Ralph Haenel, Leo Czech a former successful professional boxer and WingTsun pioneer in West Germany came for a long and intensive training weekend. However, for a long period of time so-called "unofficial collaborators" of the STASI had spied on him because of his martial art studies. In August 1988, after 6 years of covered investigation, Ralph was prosecuted for his contacts to the West and later sentenced to 3 years and 6 months in prison. The sentence, as usual for political prisoners, was dictated by the Secret Police, weeks before a staged court procedure. The West German Government and human rights organizations made his release in 1989 possible. Sifu Keith R. Kernspecht, European Chief-Instructor announces during his first Wing Tsun seminar in East Germany Ralph Haenel as the first certified WingTsun Instructor in the country. The seminar was being held in Rostock in November 1992. 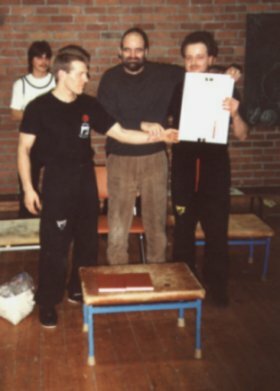 After the Wall the so-called "Iron Curtain" fell, he went on to become the first certified and licensed WingTsun instructor in East-Germany. In West-Germany he began in 1989 a self-financed education at the Langenzell Castle to become a WingTsun Kung Fu Instructor. Langenzell is a real and unique castle - located close to Heidelberg - headquarters of the EWTO the worldwide largest martial art organization. For years Ralph has also taken many additional courses throughout Europe. During this time period, as a traveling Wing Tsun instructor, he built up several WingTsun schools in five federal states of former East Germany. In 1991 a 2-page article "The WT-Martyr" has been published in "Wing Tsun Welt", the Magazine of the European WingTsun 0rganization (EWTO). As a traveling Personal Trainer Ralph has taught hundreds of students in Germany, Denmark, England, USA and Canada. Among his students are women and men of all ages, some of the age 60+. He teaches detectives, police, members of special command, and even many advanced students and instructors of various martial arts. "Non-athletic" people and Olympic Gold Medallists are learning in his schools. Instead of mass drills, often practiced at schools that teach sport-oriented martial arts, Ralph offers individualized instruction on a one-on-one basis as well as for small groups. 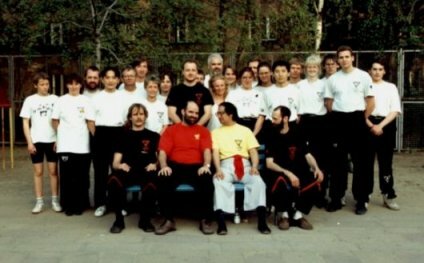 The beginning of 1994 marked the 10th Anniversary of the existence of Wing Tsun Kung Fu in East Germany through the pioneering work of Ralph Haenel. The success would not have been possible without the great support by his instructors Sifu Leo Czech, Sifu Peter Vilimek and his personal Sifu Keith R. Kernspecht, the European Chief-Instructor and headman of the European WingTsun Organization (EWTO). One of Ralph's German classes in East Berlin. Sifu Peter Vilimek, Dai-Sifu Keith R. Kernspecht, Sigung Leung Ting, Sifu Christoph Gefeke v.S. In the year 1994 I then moved to Vancouver, British Columbia, Canada. With first seminars in Victoria on Vancouver Island, demonstrations at the YMCA in Downtown Vancouver, seminars at different martial arts schools and Television and Newspaper interviews, the first Canadian Wing Tsun branch was founded. 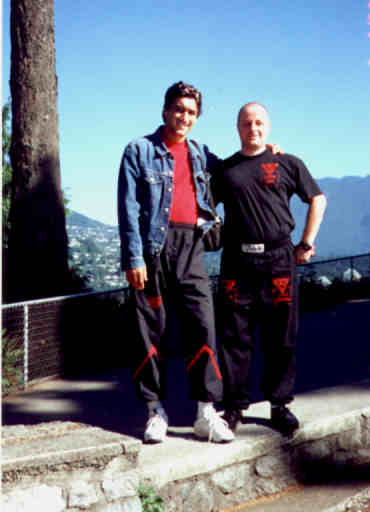 The summer of 1999 marked the 5th Anniversary of Wing Tsun in Canada. During a 3-Day Seminar Sifu Emin Boztepe, Ralph Haenel and students from British Columbia, Alberta and Washington/USA celebrated this special event. Numerous articles about Ralph’s work as Personal Trainer specialized in Realistic Self-Defense have been published in Newspapers and Magazines in Germany, Canada, Hong Kong and Taiwan. He has appeared several times on various Television and Radio Shows. Features were aired on Chek TV, Rogers Multicultural Channel, Vancouver Television, Calgary TV, MTV Canada and others. After he managed to publish a Special Edition Magazine and a Photo Calendar about Realistic Self-Defense, Sifu Ralph Haenel has published his first Book under the challenging title 'The Reality of Self-Defense! What other martial arts schools won't tell you.'. All reviews can be found at SelfDefenseBookReviews.com. For your information we have a complimentary free 24 page brochure.